In “The Ransom of Red Chief,” two small-time crooks named Sam and Bill conspire to kidnap young Johnny Dorset and hold him until his wealthy father pays a ransom. However, as soon as Sam and Bill lay eyes on Johnny, his violence towards them—both physical and verbal—eclipses the violence of the kidnapping, which actually seems haphazard and comedic rather than cruel. Despite Johnny’s violence, O. Henry depicts him as a sympathetic character—his behavior stems from his loneliness and, in particular, his father’s cruelty towards him, so he (much like Sam and Bill) seems more pathetic than evil. In this way, the story’s real crime isn’t kidnapping or Johnny’s violence towards his captors—it’s the characters’ inability to empathize with and care for one another, which is what leads to violence in the first place. From the beginning, O. Henry is clear that the kidnapping is not the story’s defining act of violence. In fact, it’s not even the story’s first act of violence. When Sam and Bill first meet Johnny, he is “throwing rocks at a kitten,” which primes readers not to feel too sorry for him as he is kidnapped. Furthermore, the kidnapping unfolds from the perspective of the kidnappers, so the reader is invited to identify with the "wrong" side of the kidnapping. O. Henry also carefully paints the kidnapping as comedic, as Johnny struggles “like a welter-weight cinnamon bear,” and the effects aren’t devastating—Johnny says, “I don’t have any fun at home” and “I never had such fun in all my life.” Once he is free to return home, Johnny even chooses to stay with Bill and Sam, which shows definitively that the kidnapping is not, in the traditional sense, cruel. Just as O. Henry softens the violence of the kidnapping, he complicates Johnny’s violent behavior. While Johnny throws bricks, beats up Bill, and credibly threatens to scalp his captors, his behavior appears to stem from a difficult home life. In fact, his childhood has been so rotten that being kidnapped is perhaps the most fun he has ever had—“I never camped out before,” he says while being held in the woods. He even begins to treat his captors as father figures and playmates. This reveals his heartbreaking desire for companionship and, by implication, the unhappiness of his home life. In this way, O. Henry gives context to Johnny’s bad behavior, showing that he perhaps doesn’t know how to treat others kindly because he has not been treated well himself. By depicting the kidnapping as relatively nonviolent, and Johnny as sympathetic despite his bad behavior, O. Henry moves the reader’s focus to a less obvious but more insidious form of violence: lack of empathy for others. The story’s least empathetic character is Johnny’s father, Ebenezer Dorset, a cold and manipulative man whose treatment of Johnny has made Johnny violent. O. Henry writes, “The father was respectable and tight, a mortgage fancier and a stern, upright collection-plate passer and forecloser.” In a single sentence, O. Henry makes clear that Ebenezer takes advantage of the misfortunes of others (“forecloser”), he is ungenerous (“collection-plate passer”), yet rigid (“stern, upright”), and even hypocritical. It also seems clear that Ebenezer has been a bad father. Johnny has more fun being kidnapped than he did during his whole life beforehand, and he also seems openly afraid of his father. When Bill and Sam finally return Johnny to his house, for example, he doesn’t cling to his father, but instead “fastened himself as tight as a leech to Bill’s leg.” Furthermore, this father isn’t eager to have his kidnapped child back. Instead of paying the ransom to protect Johnny, Ebenezer negotiates with Bill and Sam, ultimately extorting them so that they pay him for the privilege of taking his difficult child back. All of this suggests that Ebenezer has made Johnny mean and ornery through his cruelty and indifference—the story’s only unambiguous violence. While O. Henry shows that Sam and Bill’s tight finances lead them to crime, and Johnny’s bad childhood leads him to violence, he does offer hope for redemption through Bill and Johnny’s evolving relationship. At first, Johnny seems crueler to Bill than he is to Sam—he harms Bill physically, humiliates him, and threatens him—but Bill never retaliates, and he even seems to empathize with Johnny. For instance, after Johnny beats Bill up, Bill examines his own bruises and explains to Sam simply that, "We're playing Indian. I’m Old Hank, the trapper, Red Chief’s captive." Eventually, Johnny seems to understand and appreciate Bill’s patience, empathy, and willingness to play—after knocking Bill into the fire, Johnny says, “I didn’t mean to hurt Old Hank….I’ll behave if you don’t send me home.” Bill and Johnny’s mutual sympathy seems to show that, just as treating someone cruelly can make them violent, treating someone kindly can quell that violence, drawing out empathy and understanding instead. 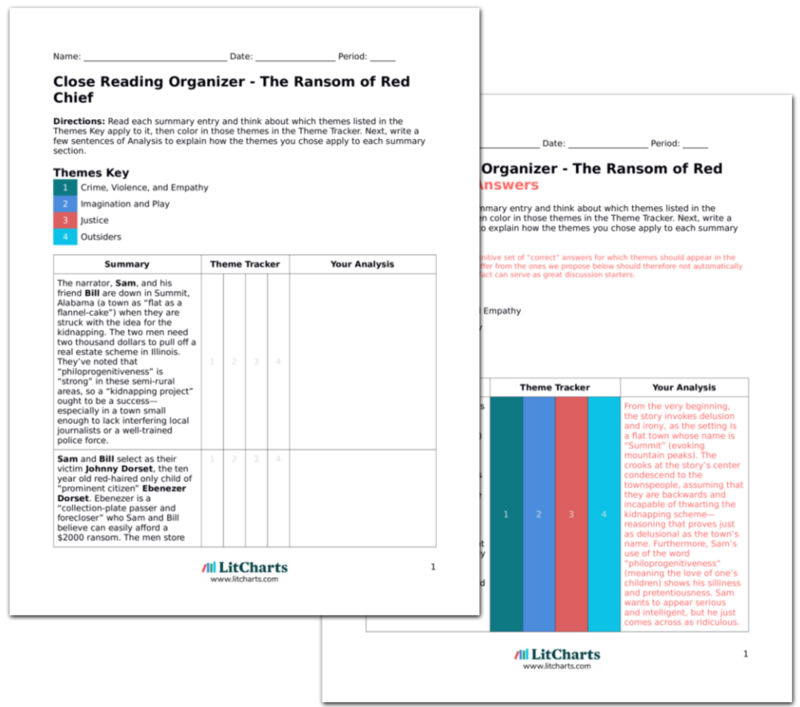 The ThemeTracker below shows where, and to what degree, the theme of Crime, Violence, and Empathy appears in each chapter of The Ransom of Red Chief. Click or tap on any chapter to read its Summary & Analysis. Below you will find the important quotes in The Ransom of Red Chief related to the theme of Crime, Violence, and Empathy. Houghton, David. "The Ransom of Red Chief Themes: Crime, Violence, and Empathy." LitCharts. LitCharts LLC, 8 Oct 2018. Web. 11 Dec 2018. Houghton, David. 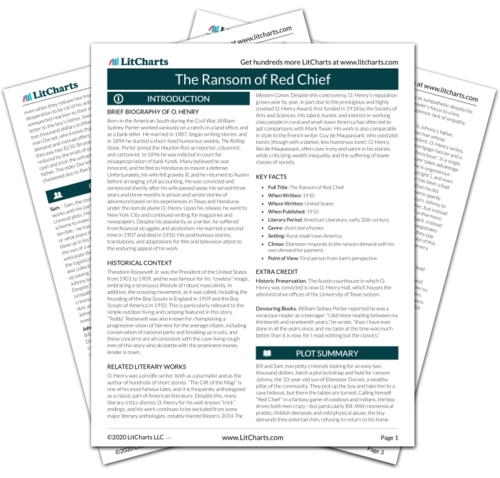 "The Ransom of Red Chief Themes: Crime, Violence, and Empathy." LitCharts LLC, October 8, 2018. 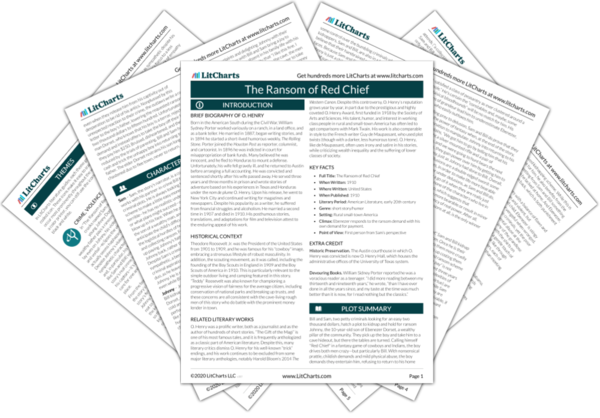 Retrieved December 11, 2018. https://www.litcharts.com/lit/the-ransom-of-red-chief/themes/crime-violence-and-empathy.